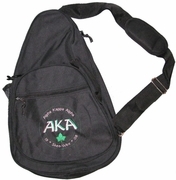 You can also customize the embroidery on your bag. You have up to 18 characters around the top, and 16 characters around the bottom. Shown - "Alpha Kappa Alpha" around the top; "19 * Skee-Wee * 08" around the bottom.